Wow, this is my 600th post!! What in the world have I been blogging about all this time? 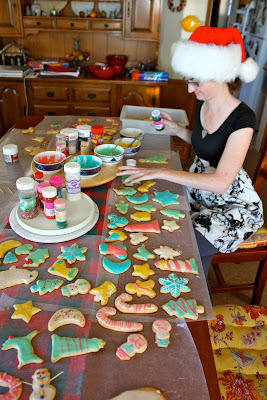 Since I love the holidays, it's appropriate today to be blogging about Christmas and cookies. It's a tradition in my mom's household to make and decorate sugar cookies at pretty much every holiday. My mom has the best recipe. I've eaten a lot of sugar cookies but every sugar cookie I've eaten pales in comparison to hers. The recipe was handed down from her grandmother - and we all know that great-grandmothers have the best recipes. This Christmas was no exception to the cookie decorating tradition. Several batches were already made and the frosting and sprinkles were laid out on the table when we arrived yesterday morning. About decorating... My sister makes the most beautiful cookies. Ever. Hands down. To a certain extent, it takes the pressure off the rest of us because we know ours are going to look plain and ordinary in comparison. The hubs, on the other hand, usually decorates in themes. This year was the year of the 'red, beady eyes." Case in point: The Polar Bear. He got quite creative with his snowman but the 'red, beady eyes' he chose actually made the snowman more fun and less creepy than he was hoping. The hubs would have decorated more cookies (I think this year he did five, which was a great improvement over the three he did last year!) but adding 'red, beady eyes' to a moon or a lighthouse just isn't as exciting as a polar bear. Though he certainly would have tried if we'd let him! Just to give you an idea what he was up against - these are a few of my sister's cookies. Aren't they fantastic? Works of art, I tell you. It is hard to compete against Mrs. Claus. I didn't even bother to take pictures of my cookies because they're so plain and boring compared to all the others but you can see a few of them in the bottom left corner of the picture above. As I typed this, my grandfather arrived for the day and my mom put a plate of beautiful cookies on the coffee table as a snark. And we're being called to open presents!! Pictures by me. Please don't use them without asking first. Because they're just that awesome. Was it once a rocking horse?? I love the snowman with the toothpick arms. Haha, yes, Holly! It was a rocking horse. Last year he made a chihuahua our of a dove... go figure.